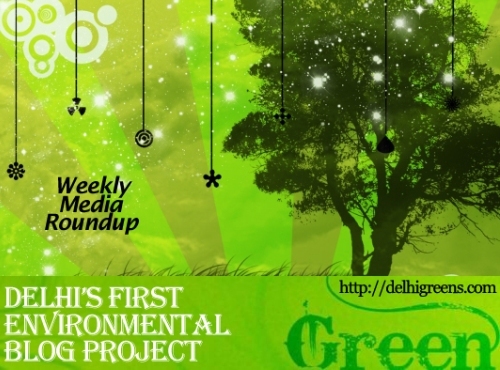 Weekly green news update from across different media networks for week 12 (between March 21 and 27) 2016. The Delhi government is planning to set itself the ambitious goal of planting 15 lakh new trees in financial year 2016-17, even though it is yet to achieve last year’s target of planting 13 lakh trees. During the second phase of its odd-even scheme from April 15 to 30, the Delhi Government will be expanding its air quality monitoring from the national Capital to neighbouring regions where devices would be installed to measure air pollution. Wildlife SOS rescued a four-foot Indian cobra spotted in a park near a residential area in south Delhi’s Kalkaji recently. Delhi Government celebrated World Forestry Day and World Sparrow Day on Monday. The National Green Tribunal on Monday took Delhi Jal Board to task for spending money on Yamuna without its permission and directed it not to spend a “single penny” on rejuvenation of the river without its approval. Power distribution companies in the capital on Wednesday came under fire from the National Green Tribunal for putting high tension cables on trees, with the green panel warning of action against their top bosses if the wires were not removed within six weeks. It looks like candy floss but it not. Pink foam from toxic industrial waste floating in the river Yamuna at Wazirabad in North Delhi is yet another reminder of how polluted the river is. Your desire for a squeaky clean skin could be polluting the environment and even hampering our health by entering into the food chain with microbeads/microplastics now being identified as the “tiny’’ pollutants that we need to watch-out for. The National Green Tribunal on Tuesday questioned the Union Ministers of Environment and Railways about the delay in fixing emission standards for diesel locomotive engines in the country. People’s interest in birdwatching is growing by leaps and bounds in India and Uttarakhand is being recognised as a birding haven. This became evident with the results of the recently held Great Backyard Bird Count – the largest synchronized bird count event in the world. Environment Minister Prakash Javadekar today said peoples’ cooperation is needed to improve the quality of forests and to enhance their scientific management . A germplasm garden, a first-of-its-kind initiative to conserve and save precious forest resources, was inaugurated at Bahadur Hill by Millo Tago, CCF, Central Arunachal Circle, Pasighat, in the presence of a large gathering of forest staff and public on Thursday, an email received from DIPRO, Aalo, here stated. The air pollution levels in the city remained in the “poor” category for the second day in a row with no immediate relief in view as the fire at the dump, which observers blamed for the worsening pollution, aggravated on Monday evening. India’s “unique” Agasthyamala Biosphere Reserve in the Western Ghats is among 20 new sites added by the UN’s top cultural body UNESCO to its World Network of Biosphere Reserves.